Practitioners in social work and a variety of social work and health and human service disciplines rely on findings, conclusions, and recommendations from psychologists to make case planning decisions with and for their clients. This book provides essential information to help readers become knowledgeable, informed consumers of psychological assessments. This book seeks to make psychological assessment and test data more accessible to referring professionals; by better understanding of the strengths and limitations of various assessment tools, non-psychologists will be empowered to design more effective treatment plans. The book provides an elementary primer on the major principles, methods, ethical values, and practitioner competencies involved in psychological assessments and testing. It further delineates key competencies needed by helping professionals to make referrals, prepare clients, evaluate the quality of reports, and apply assessment and testing data to case plans. 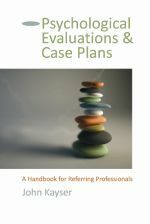 The book includes detailed guidelines and numerous illustrations about how to integrate psychological assessment information into case plans. Serves as a consumer’s guide for nonpsychologist professionals who refer clients for psychological assessments, and who use the evaluation findings and recommendations in making case plans. Provides sample reports and clinical examples designed to help referring professionals determine whether the evaluation report adequately has answered the referral question and provided clinically useful recommendations. Promotes interdisciplinary collaboration between referring professionals and evaluating psychologists to improve treatment planning and case coordination for clients.